Birthday wishes that they will remember come inside this fun, festive handled box. Here is a collection of some of our favorites starting with Peanut Butter Wings® (8 oz), a special Chocolate Pizza® Slice decorated for the occasion, a chocolate covered cookie with birthday sugar decoration and one of our fun Moompas – chocolate covered cream filled sponge cake bursting with personality! Open this Birthday Bash and watch the smiles shine through. Birthday Bash tote box is your happy birthday chocolate go-to choice for that awesome surprise everyone enjoys on their special day. 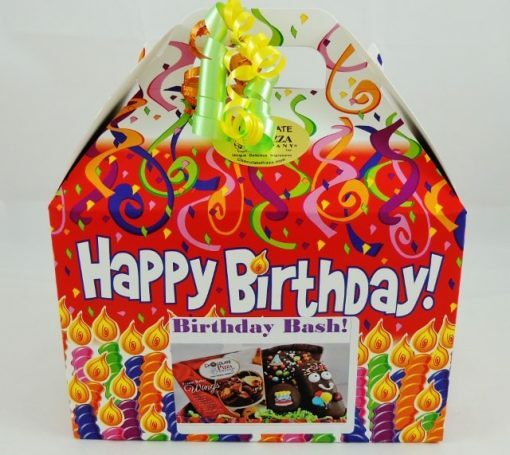 If you’re going to celebrate birthdays – and you should – then happy birthday chocolate is the way to go. 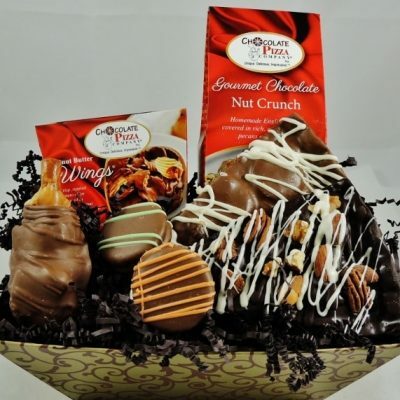 Packed with a super selection of Chocolate Pizza Company favorites in a handled tote box this gift delivers all the sweet wishes you can send. 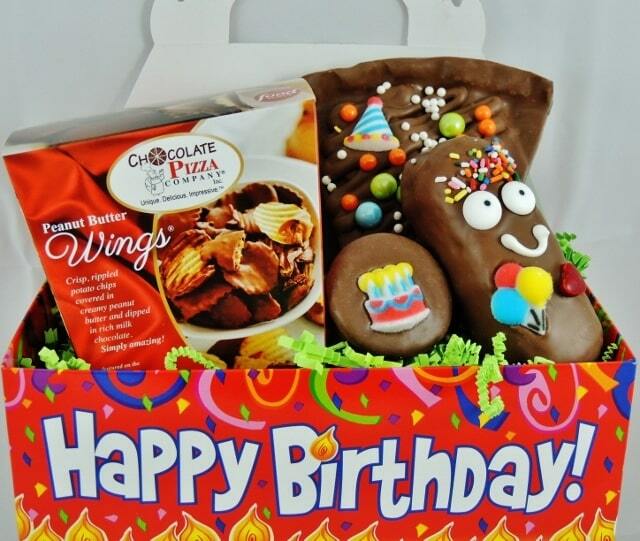 The good news is that your search for that unique and delicious birthday gift is over – you’ve found it! See, wasn’t that so easy. Trust Chocolate Pizza Company for all your special occasions. Chocolate Pizza Company handcrafts unique, delicious, and impressive chocolate specialties that make gifts for every occasion. Variety is at the heart of a gift basket – a chance for the lucky recipient to peruse the many offerings and select just the right one for the moment. 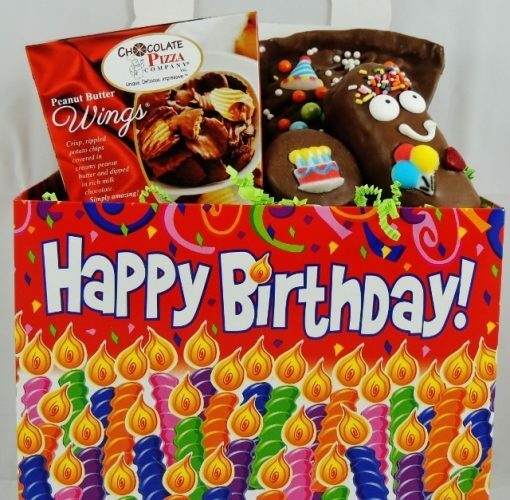 Gift baskets are one of the most popular gift choices for any occasion because the presentation is beautiful and the contents are easily shared. What could be more fun than a chocolate treasure hunt when you have all the goodies right there in front of you. 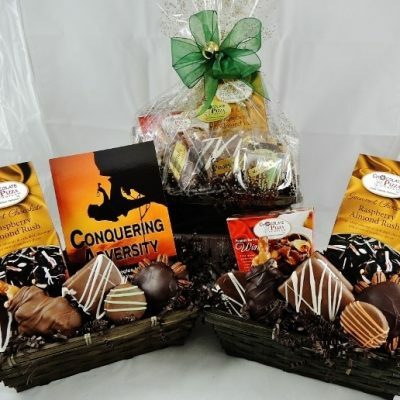 Chocolate Pizza Company is known for creating impressive gift baskets filled with unique chocolate specialties for business or personal occasions. For a less expensive and fun alternative, choose a handled tote box that still delivers plenty of gourmet chocolate sweets. The easy carry container is cheerful and convenient and adds an element of surprise about the sweets inside. Of course, Chocolate Towers are as impressive as they are generous in content. These soaring stacks of sweets grab attention the moment they arrive and deliver a bounty that is easily shared. Every choice is a great choice when you bring together so many of Chocolate Pizza Company’s best tasting confections. Whatever you choose, you know they’re going to love it!